A depth gradient may influence both macrophytes and their associated epiphytic community through variations in hydrodynamics and light conditions, which in turn may affect the mobile organisms living on them. We investigated how a narrow depth gradient affects the associated peracarid assemblages in a Sargassum cymosum bed. This study was conducted on a rocky shore in Southeastern Brazil. A 20 × 3 m sampling area was defined parallel to the shore line, within which three perpendicular transects were sampled in October 1997 (spring), January 1998 (summer), April 1998 (fall), and July 1998 (winter). In each transect, three samples of Sargassum were randomly collected at three different depths—shallow (1 m), intermediate (2 m), and deep (3 m). Peracarid fauna was identified, quantified, and classified into feeding groups. Depth affected both species richness and total density only in January, with fewer species and individuals at the shallow depth, more species at the intermediate depth, and more individuals at the deep depth. 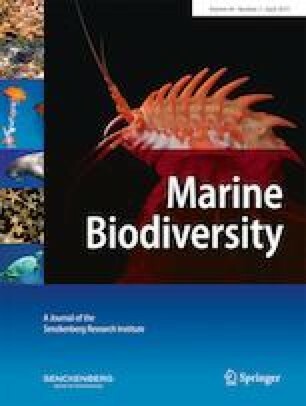 The taxonomic and feeding group composition of peracarid assemblages were also affected by depth, with differences depending on the sampling period. Herbivores and omnivores were commonly more abundant at the shallow depth, while detritivores were more abundant at the deep depth. Carnivores seemed not to be affected by depth. Small-scale distribution patterns can be related to how peracarid species deal with the variability in turbulence and food availability imposed by a depth gradient, with morphological attributes and feeding habits guiding how species are distributed in the space and thus the peracarid assemblage as a whole. The online version of this article ( https://doi.org/10.1007/s12526-018-0885-6) contains supplementary material, which is available to authorized users. A scholarship grant to GBJ was provided by CAPES – “Coordenação de Aperfeiçoamento de Pessoal de Nível Superior.” Financial support for FPPL was provided by CNPq – “Conselho Nacional de Desenvolvimento Técnico e Científico” (300337/82-5). We thank FAEPEX – “Fundo de Apoio ao Ensino, Pesquisa e Extensão,” which partially funded this research and CEBIMar-USP – “Centro de Biologia Marinha of Universidade de São Paulo,” for logistical support during sampling periods. We also thank A. Z. Güth and D. Silva for sampling help, L. Waters for English review, and the two anonymous reviewers for providing valuable comments and suggestions. A scholarship grant to GBJ was provided by CAPES – “Coordenação de Aperfeiçoamento de Pessoal de Nível Superior.” Financial support for FPPL was provided by CNPq – “Conselho Nacional de Desenvolvimento Técnico e Científico” (300337/82–5). We also thank FAEPEX – “Fundo de Apoio ao Ensino, Pesquisa e Extensão,” which partially funded this research.